Cast The Stone released their debut album back in 2005. 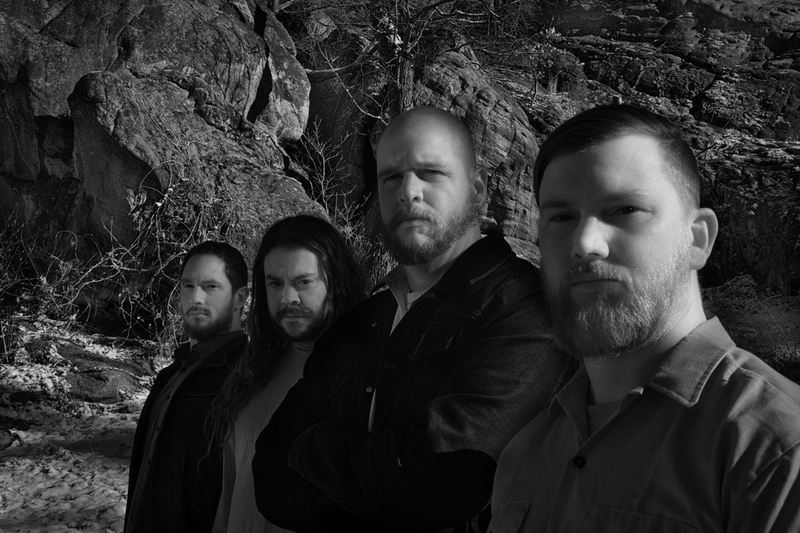 With the obligations of members Mark Kloeppel (Misery Index), Jesse Schobel (Legend) and Derek Engemann (Cattle Decapitation/Scour) to their other projects, it took a while for them to get around to their sophomore release, the EP Empyrean Atrophy, which features Andrew Huskey on vocals. Kloeppel fills us in on Cast The Stone along with his other projects. Chad Bowar: What led to the reactivation of Cast The Stone? Mark Kloeppel: It was pretty natural, so I guess it was just “time.” Cast the Stone is what we all were doing before moving into our metal-scene-mainstays, and we never forgot about it or stopped talking about it. We’d been sitting on some demo material for awhile, and decided we would shop it around. Agonia took a listen, and decided to offer a deal for an EP and a few albums. Describe the songwriting process for Empyrean Atrophy. Essentially, Derek and I sat in a room with acoustic guitars and just jammed. Out of that, we came up with all this cool themes and motifs, which we then developed into song structures. After that, we shot demos to Jesse for his input. Once finalized, Derek would weave his bass line through all of it, sort of “stitching it together” so to speak. Then Andy and I got to work on lyrical themes, cool patterns, and how the vocals should sit within the song. The way it works varies from song to song, but that’s generally our process. How did you decide to work with producer Dan Swano, and how was the experience? I met Dan through Jason Netherton, my bass player in Misery Index. Jason had been writing a book on death metal history called Extremity Retained, which is a “from the horse’s mouth” oral history of the scene by the people who created it. So I started emailing him just to be a fanboy nerd because I love Edge of Sanity and Infestdead! His musical and mix work are both incredible, and, given our Swedish death metal stylistic tendencies, he was an obvious choice. How had the band’s sound evolved since Dark Winds Descending? That was really just a full length demo of a bunch of guys with no clue what they were doing. We recorded that thing in a house we shared with a bunch of gear we “borrowed” from the University nearby. It was a novice approach to songwriting, but, within it, were some magical musical moments. So, we took note of those happenings, and, from our more experienced perspective, crafted some songs that better capture our essence and sound. Back then the material was more of a hodgepodge of our influences, where we’d stumble into our own sound. The new EP is more refined and more our own thing. We are still developing and growing further, and that is going to be evident on the full length follow up to this initial EP. What led you to cover Infestdead’s “Jesusatan,” and how did you approach the arrangement? That’s got to be all four members’ favorite death metal record. The riffs are just a lot of fun, and every song is a headbanger. I know it’s a little obscure being a Deicide-worship drum machine project. As Dan says, he made that record as a learning exercise in recording on a Apple Mac. The production sounds that way as well. So we thought it would be a cool thing for all of us, Dan included, to give that title track a nice “full production” makeover with real drums and the whole nine yards. It turned out great. We love it. Additionally, we are huge fanboy nerds of Dan. So, it was cool to work with him on it. How did you come to sign with Agonia Records? They somehow caught wind we were shopping around, and asked to hear the material. As you know, Agonia has been transitioning out of misanthropic blackened type stuff to also include stuff like Origin and Decrepit Birth. Our stuff is sort of a happy medium between those worlds, so it just made a lot of sense for everyone. They offered us a deal, and considering all that, and their stellar reputation, we accepted. Agonia has a really good grasp on how to market and distribute this kind of music in the murky conditions that are the current state of the music industry. We are just trying to reintroduce a refined version of our sound, let everyone know we exist, and prepare the ground for the next full length. So, this is just functioning as an introductory phase. That said, looking at our rate of increase of social media and streaming platform engagements, and what we know about the demand on the distribution side, it’s looking like this is going to be a solid first release. You have a release show in Kansas City. Any other show/tour plans on the horizon? We are also pretty high up on the bill for the Full Terror Assault festival. With all the hype around the band right now, we were just approached by Continental Concerts USA and MAD Tourbooking in EU to book the band. So we are planning things out with them and checking out what’s possible. Were you satisfied with the response to Scour’s latest EP Red? Red is a great release, and it got on the Billboard charts even while being released in November and being an EP. That project is really taking flight. I absolutely love those songs that Derek wrote, as it’s primarily Derek’s brainchild. It seems everyone is really digging the songs. We recently played the Roskilde Festival to a full tent. With Phil Anselmo in the band, obviously we are going to give you a little Pantera as part of the live show. But, even Phil noticed, the crowd was getting into the Scour songs just as much as the Pantera songs at the end. It’s good to see the public fully embracing our frontman’s more extreme material, because Scour is pretty far away from Pantera stylistically. What’s the timetable for the next Scour release? I cannot reveal that at this time. What’s the status of the next Misery Index album? All the tracks are over to our producer for an early 2019 release. How difficult is it to balance multiple bands and a personal life? I also manage bands for Extreme Management Group, and I don’t just have a ‘personal life’ as much as I have family time with my wife and two sons. It’s just about managing your time correctly, and it’s not always easy. The reality, though, is that time and experiences are all you have in this world, and I’m just trying to create and do as much as possible. Some day I’ll have less energy and I’ll just do less at that point. But, until then, go hard or go home! The promotion process has changed a lot since you started, mainly due to social media. Are you a fan of the transparency with studio videos and constant updates throughout the process, or do you miss the days where there was more mystique behind an album release? It’s just a different experience. I do like how interactive and social bands are with fans now. It’s like everyone is getting a backstage experience, which is cool. For better or worse, it’s demystifying. But there is something lost there. It’s harder to foster idols and heroes, because a hero is just someone you only see at their best, and no one is at their best 100 percent of the time. Perhaps the hero idea is fictitious, but I think people need idols. I certainly needed my larger than life guitar heroes to inspire me when I was young. I needed to have an example to strive for, and that is becoming lost in favor of a reality TV imperfect version of those idols. The flip side is that there is a widespread mindset that you must accept people the way they are, and not how you think they should be. So, I think that’s a positive aspect of the current climate. To conclude, I think it’s just different. From an artist perspective, I think there is a lot of pressure to market yourself down these channels, of which there are many. In terms of access, anyone can reach a lot of people. But, in terms of actual influence, that gets a little lost in the inundation of information. Everything today is geared toward the opening week numbers. There are no slow builds anymore. Is that a good plan by the labels to do it that way? I don’t think I agree with that. There are plenty of underground labels and bands that don’t concern themselves with metrics like that. I’ll use the whole Iron Bonehead/Testimony/Kill Town scene as an example. Organic building and anticommerce is totally embraced in that scene. I think you probably have gotten this impression because some labels that embrace capitalism have used this metric as a media content tool; basically, just to have an extra thing to have the press pick up. They are trying to inspire a bandwagon mentality in the public and also just to advertise the presumed success and the band and label itself. You’re supposed to assume that the first week sales is indicative of a band on the rise to permanent popularity and prosperity, which is not always the case, as it’s not the prediction of sales but the final actual sales of an album that count. You could be number one on the Billboard charts this week, but Metallica’s Black Album still outsold you this week and next week and every week thereafter and before. With the business model going toward renting music (Spotify, Apple Music) and away from purchasing it (CDs, MP3s), what needs to be changed so that artists can be fairly compensated? Laws. And, luckily, things are starting to be restructured. Scour, Cast the Stone, and new Misery Index. (laughs) With all the shows coming up, and Misery Index album mixes to review, I’m pretty focused on my own stuff. If not that, I’ll listen to Tragedy or Rättenfänger or something. Look out for the Cast the Stone release Aug. 31, Scour later this year, and Misery Index early 2019. Also Misery Index and Scour have signature distortion pedals with Amptweaker Pedals. Check it out.